STRATFORD, CONN., February 2019 – The New York Institute of Credit (NYIC), educator to the financial community, today unveiled a new brand identity represented by the introduction of a newly revamped website and corporate logo. 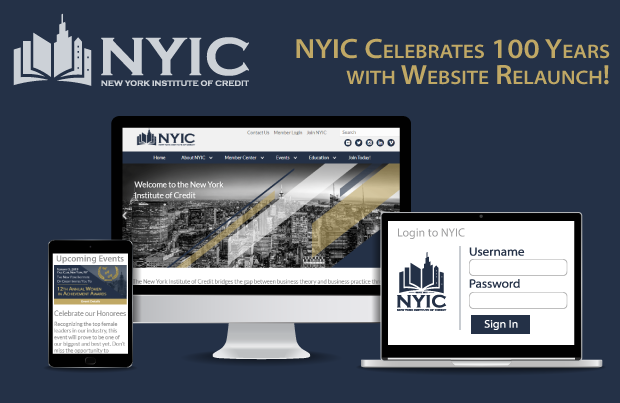 The launch of NYIC’s new website design kicks-off an innovative era, symbolizing the company’s growth and transformation over its 100 year history. NYIC’s redesigned website offers audiences a more comprehensive understanding of its mission and value proposition. Boasting a cleaner design, improved functionality, and enhanced content, the new website allows for easy access to Continuing Professional Education (CPE), while also providing members the ability to track receipts, register for events, access their profile, and opt in for speaking opportunities. NYIC continues to embody a highly responsive, member-focused mindset, modernizing its brand to adapt with the direction of the financial industry. With the primary goal of resonating with it’s members, NYIC developed a new website that provides a more intuitive user experience and expanded member database, giving quick and easy access to essential member information. "We are excited about our new website launch and the robust information it provides for clients, members, and partners to better understand NYIC’s mission," said Sarah Kuhns, Associate Director of NYIC. "Our new brand identity is designed to visually and symbolically express NYIC in a modernized look and feel, while continuing the message behind our 100 year history. We believe that this new site will allow our visitors to have a very informative experience as we continue to grow and increase our presence in the financial market." NYIC began in 1918 and later grew into the leading education group for the credit industry with wide support from practitioners, attorneys and judges. As a non-profit organization, NYIC offers monthly seminars, workshops, conferences and awards, drawing over 2500 attendees annually to its programs. The new NYIC website will be updated on a regular basis with corporate milestones, upcoming events, and newsworthy information. Explore the website at www.instituteofcredit.org. The New York Institute of Credit (NYIC) was founded in 1918 as the New York Chapter of the National Institute of Credit (NIC). In 1957 NYIC was granted an absolute charter as an educational corporation by the Board of Regents of the State of New York. As a non-profit organization, NYIC has always attempted to bridge the gap between business theory and business practice. As a result, the faculty of NYIC consists of educators who are primarily credit executives or prestigious and articulate accountants or lawyers who are appreciative of the value of a close alliance of the professions. The synergetic education created out of that special relationship has been effective and acknowledged. The administration of the NYIC is conducted by a board of directors, elected officers and a staff which is headed by an executive director.